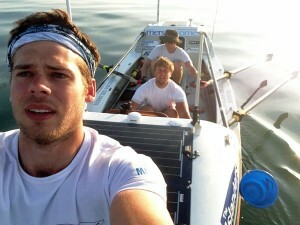 Race leaders, four-man team the Islanders, last night safely made the 12-mile crossing between Ulster and the Mull of Kintyre. Alan Morgan, from Mersea Island, Essex, told how their tiny 24-foot-long rowing boat, the Black Oyester, encountered a gigantic container ship, the Mirana, in the middle of the North Channel. As the huge ship loomed out of the darkness, Alan and Josh on the oars, were able to avoid a collision by waiting until the vessel’s towering sides had passed and rowed past her stern. More than 125 miles south, in the Irish Sea second-place Savoir Faire have made 30 miles since leaving Dun Loaghaire harbour last night. Josh Tarr and Jason McKinlay could reach Belfast by tonight and be in Scottish waters over the weekend, if the weather holds.